BOHEMIA, NY--(Marketwired - Jun 8, 2016) - AmpliTech Group, Inc. (OTCQB: AMPG) (the "Company") announced today that they had very positive results from their recent exhibition at The International Microwave Symposium IMS2016 (http://www.ims2016.org/). 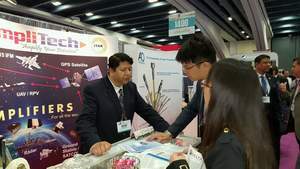 The show had an attendance of over 15,000 engineers, students, and companies from all over the world to attend conferences and exhibit their products. 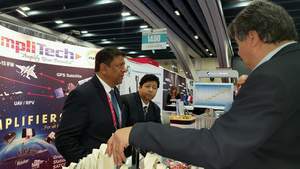 Fawad Maqbool, the CEO, stated, "The show was a huge success and although we usually always have good traffic, this year was the best in many years. We have already received over $200K of orders as a direct result of meetings at the event, and we expect to book much larger orders from new prospective customers that visited our booth at the exhibition. We have also made contact with investors and companies interested in working with AmpliTech for more joint ventures and products. The Company's backlog is rising and we expect good 2nd quarter performance as well as the rest of the year." The company expects to get a similar response from the new trade show named EDICON2016 http://www.ediconusa.com/aboutconference.asp) later this year in September in Boston. AmpliTech Group, Inc. designs, develops, and manufactures custom and standard state-of-the-art RF (Low Noise Amplifiers (LNA) and Power Amplifiers (PA) for the Domestic and International, SATCOM, Space, and Military markets. These designs cover the frequency range from 50 kHz to 40 GHz -- eventually, offering designs up to 100 GHz. AmpliTech also provides consulting services to help with any microwave components or systems design problems. Our steady growth over the past 13+ years has come about because we can provide complex, custom solutions for nearly ANY custom requirements that are presented us. In addition, we have the best assemblers, wires, and technicians in the industry and can provide contract assembly of customers' own designs. Click here to view AmpliTech video.